good news on the hope act!!! praying for more good news!!! I just came from Carissa's blog ... this post has really touched my heart! We are in the middle of adopting a little boy from Ethiopia and it such a blessing to see other adopting families. I also know the feeling of praying for things so much bigger than us (laws have been changed and effected our adoption in the last week). But God is so huge and so faithful to bring it all about! I think it's so wonderful that you're adopting this little girl - what a blessing you will be to her ... and she'll probably be an even bigger blessing to you!! :) I am your newest follower and I look forward to lifting you and your whole family up in prayer throughout your journey! I came over from Carissa's blog. This is so wonderful! I will be praying for this! Cindy, found your blog thru your sister in law, Carissa. I am your newest follower. I hope "K" finds her way to your family soon! This is amazing and makes me cry. I love your story and can't wait to read more. It is part of our dream to adopt and I love that you are doing it. I just came from Carissa's blog, and I just wanted to say that you are so inspiring...I love how you are actually putting your thoughts into actions. So often, I'm very ashamed to say, I just feel like whatever I would do would be so small that it wouldn't help....but you've proven that wrong! Thanks so changing my mindset. This little "K" is so beautiful, and the pain in her eyes is so obvious. I hope hope hope that she will be in your arms very soon. Just found your blog from your SIL. We are on the waiting list to adopt a son from Ethiopia. We are resting completely in our faith that God will bring him home to us. I look forward to following your blog and your journey to your daughter. Your letter to your sweet one just wrung my heart. Praying for this act of Hope to pass! And blessings to abound to your family as you follow God's heart! I found you through Carissa's blog. What a touching letter! I will pray for the act of hope to pass and also that your sweet girl will be with you soon! Blessings! Oh I just love her... I am praying for your sweet family! I am friends with Carissa and Kelly and we are also in the same community group. Just wanted to let you know that our group and me and my husband are praying for the Hope Act to pass, this special girl, and your sweet reunion with this precious girl! That letter is just precious! I found your story from Carissa's blog... and so glad I did. I will keep your family in my prayers. And praying The Hope Act passes! We seem to have a lot in common. I have been working tirelessly to get anyone and everyone to listen in hopes of supporting the HR4603 bill. Last week I received confirmation that Congressman Brad Ellsworth became a co-sponsor. I have asked Senator Richard Lugar to sponsor a mirror bill in the senate, but have yet to receive a response. I have a personal contact there due to some challenges with one of international adoptions. However, I've not heard anything back yet. Indiana's other senator, Evan Bayh, just released information that he will not be running again. Therefore, he is obviously not going to be motivated to do anything new. So we will just continue to pray that our government officials hear the voices of adoptive parents and those with a heart for the children of Haiti. Blessings to you in your continued efforts. Many have moved onto the next story or big disaster. 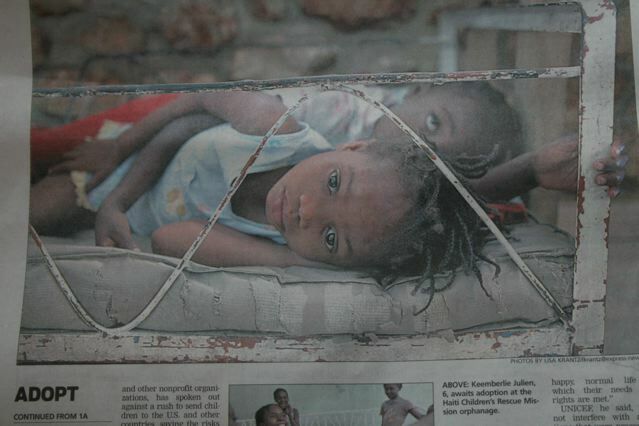 My hope is to keep this story alive and get help for the orphans in Haiti. You seem to have the same goal. May God show favor upon you as you take this task on. This post speaks to exactly what is pressing on my heart right now. We too are stuck in the humanitarian parole process. My Haitian daughter, Gaelle, will turn 6 years old on March 30 and I am so praying for her to be home by then. We live in Weatherford, TX and are a part of 17 families in our area adopting children from Haiti from All Of God's Children Orphanage (GVCM). We are praying along side you for this HOPE Act to pass. God is bigger than any piece of legislation and we are believing He will bring this story to completion with Gaelle in our arms and I pray the same for you as well to have K in your arms. So great to hear from other families going through the same process! Keep fighting the good fight on behalf of these children and do not grow weary of doing good! Cindy! Your letter made me WEEP. K is so blessed to have you for a Mommy. I know a day is coming when she will be able to read this and tell you herself. I'm so thankful that God called you to be her family. And most importantly, I praise God that she will come to know HIS love through yours.